Happy holidays everyone! 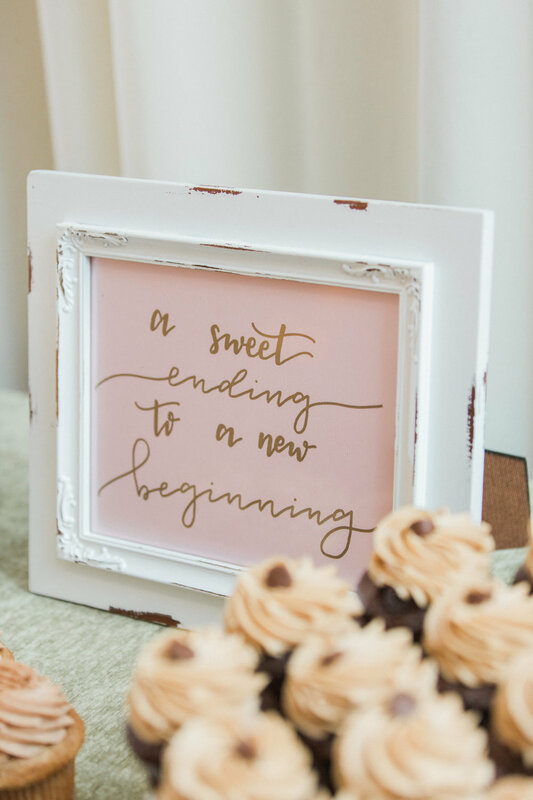 I have been on a major blogging hiatus during a wonderful busy wedding season, however I am so excited to dive back in and share more of our 2018 weddings! Kicking off with this beautiful one from this past May. 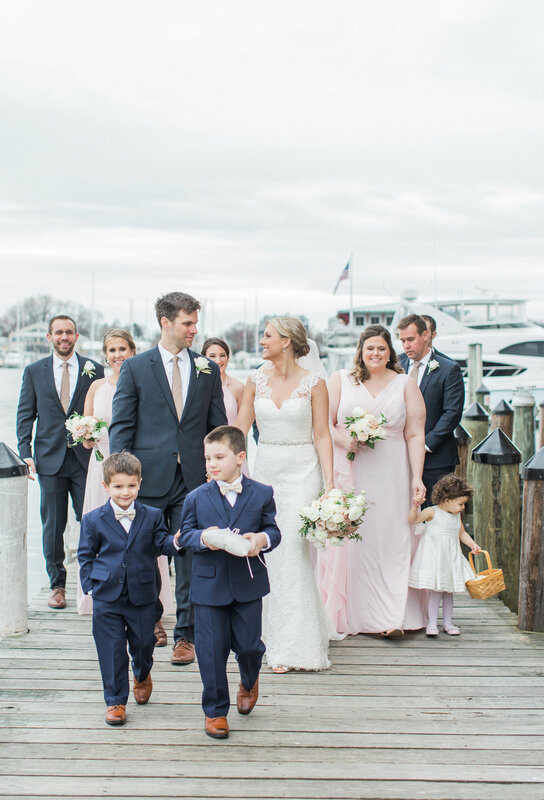 Lacey and Marc, who originally met at their local church group, had a classic, thoughtful celebration that included meaningful details as nods to their cultures and travels together. Marc proposed at the top of a mountain in the Scotland highlands, once he and Lacey reached the peak. 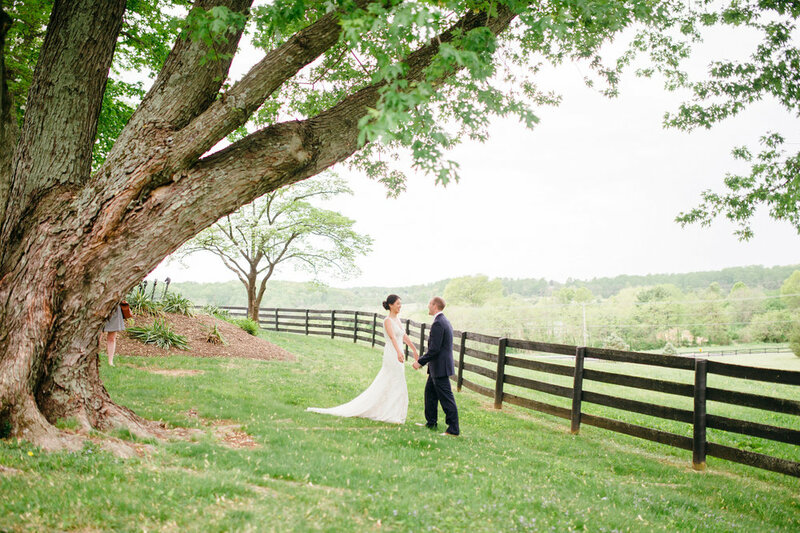 We focused their wedding design concept on reflecting their love and nature and the outdoors, as well as complimenting the natural beauty of the venue, The Black Horse Inn in Warrenton, Virginia. Guests were seated at tables named by cities all over the globe that had a special place in their story. 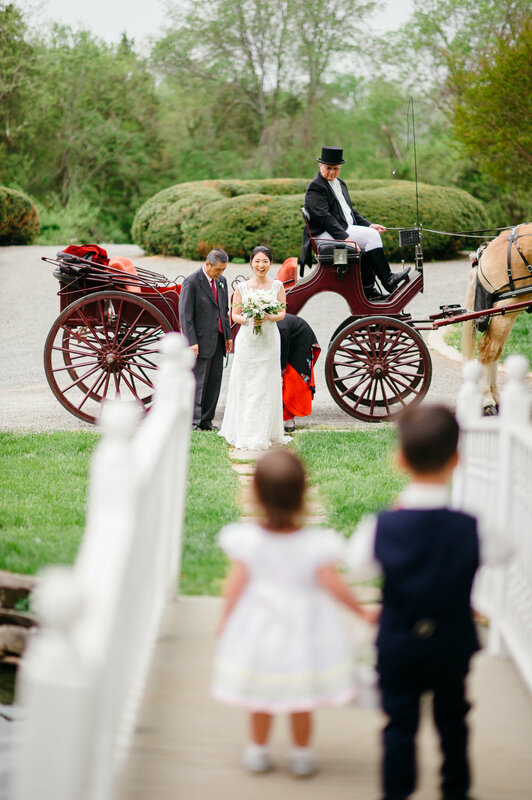 Their wedding took place on derby day, so it made perfect sense for Lacey ride into the ceremony with her parents on horse & carriage (not to mention the Black Horse Inn’s beautiful stables fit the bill!). Grove Lettering Co. designed double sided ceremony programs, with a Chinese translation on the reverse side for Lacey’s family and friends who traveled in from her home country. Their ceremony was officiated by their Reverend from the church where they originally met. 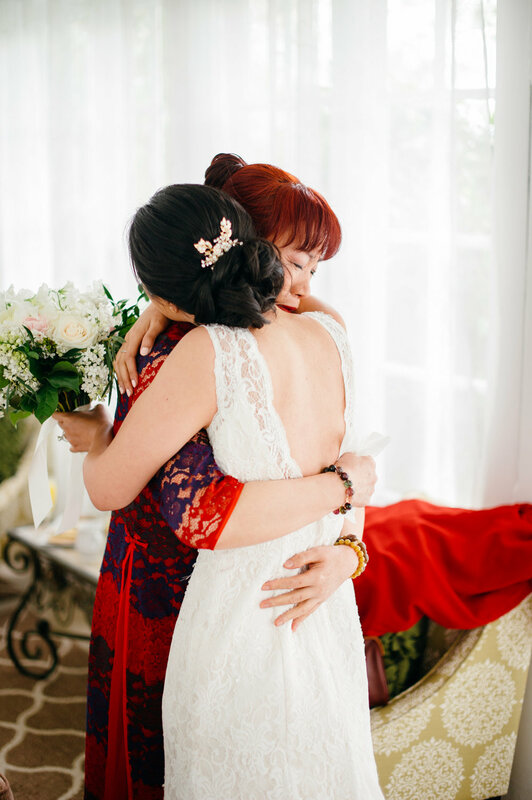 Following dinner, Lacey changed into a traditional red Chinese wedding dress to honor her culture. 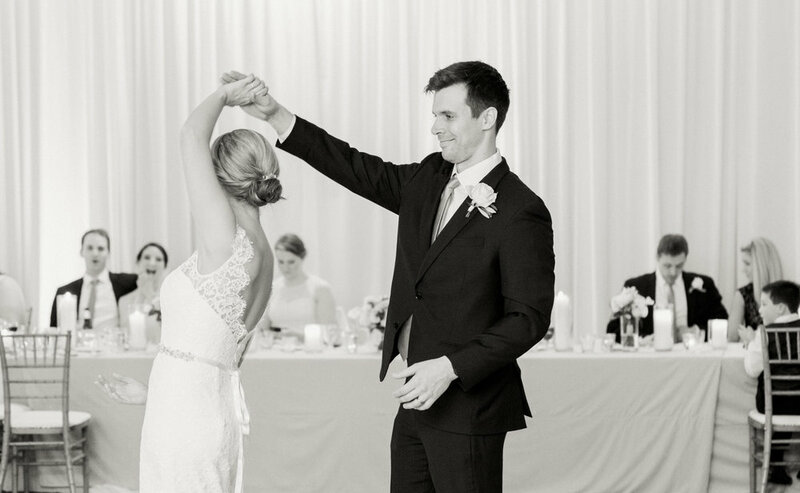 Guests danced the night away and enjoyed the specialty Scotch bar, a nod to the location where they we’re engaged. 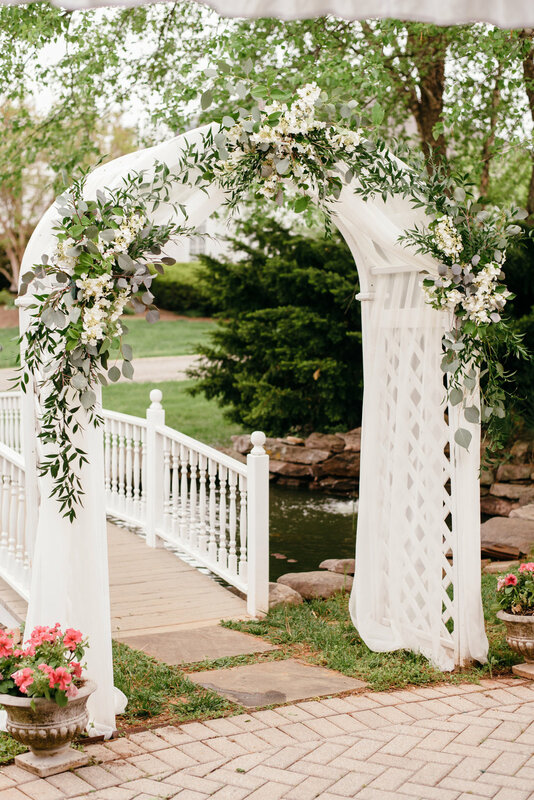 Enjoy these beautiful images captured by Rebekah J. Murray Photography, and check out the full vendor team at the bottom of this post! 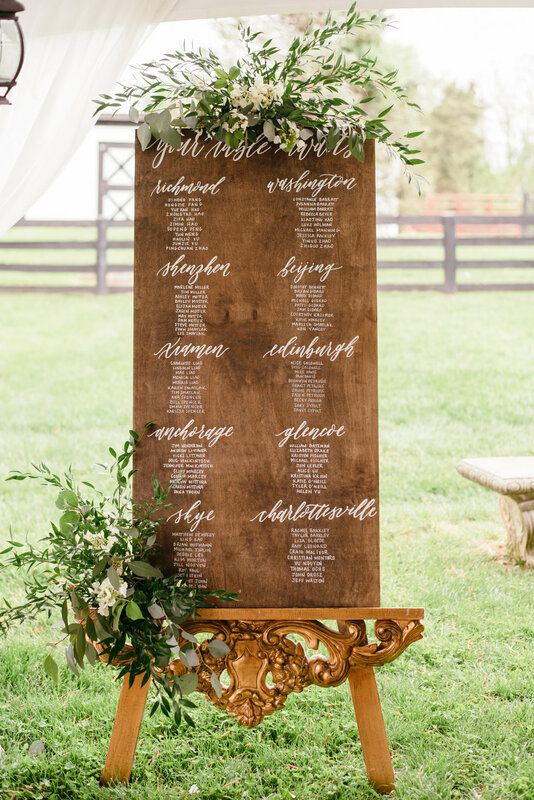 Calligraphy | Grove Lettering Co.
My 2018 wedding season kicked off with Emily and Mike's wedding on the bay in Annapolis, Maryland and it was one for the books. Emily and Mike met by sheer luck out with their friends one night in Baltimore, just before last call. They exchanged numbers and soon thereafter, Mike asked Emily out on their first date. One date lead to another, and the rest was history! 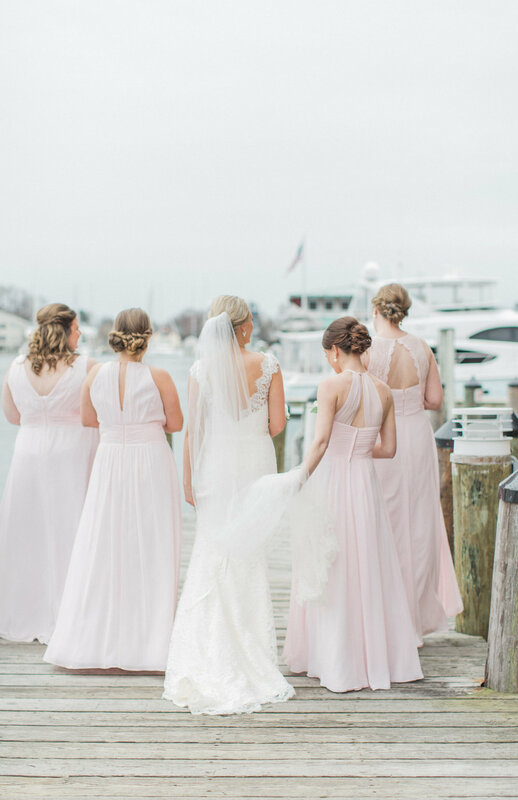 When Emily first came to me, she described how she wanted to transform the ballroom at Annapolis Waterfront Hotel into a light, ethereal and romantic setting. We also wanted to include subtle, playful nods to St. Patrick's Day that aligned with that vision. 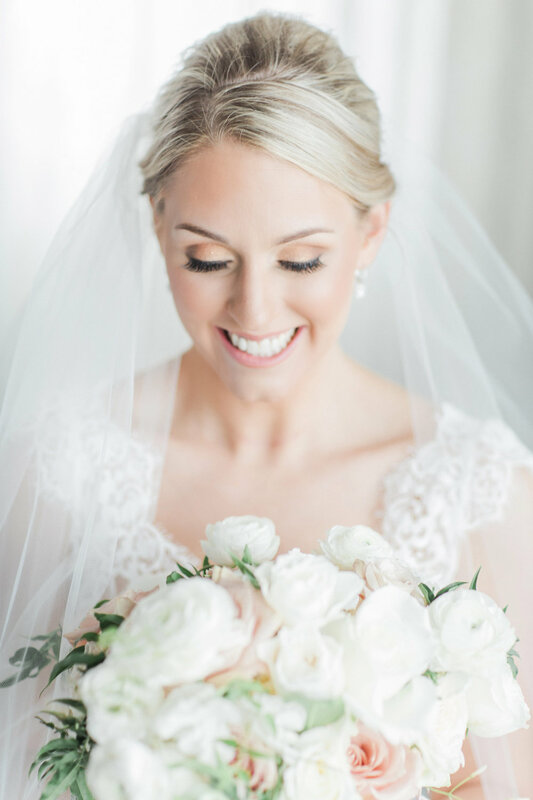 Look ahead to these stunning images by Dyanna LaMora, and I would say mission accomplished! Dunkirk Designs created a custom crest with mini shamrocks for their wedding programs, favors and cocktail napkins. 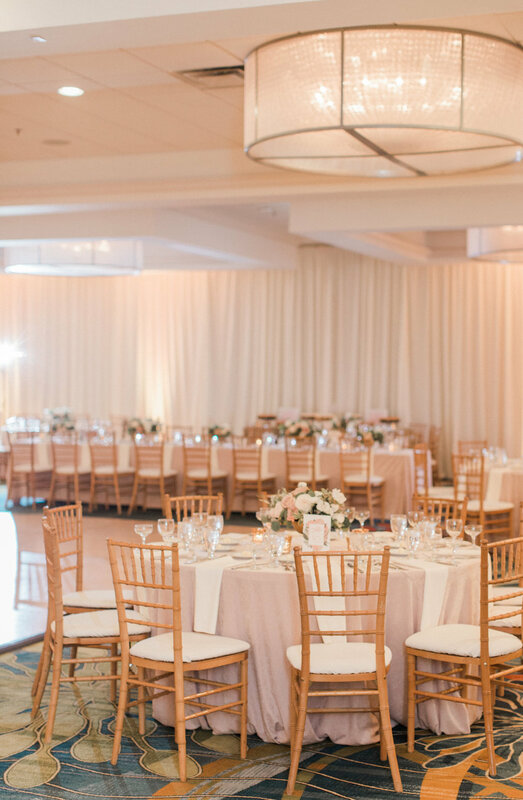 We drew attention away from the ballroom's dark carpet with gorgeous draping and uplighting around the perimeter of the ballroom by Event Dynamics. 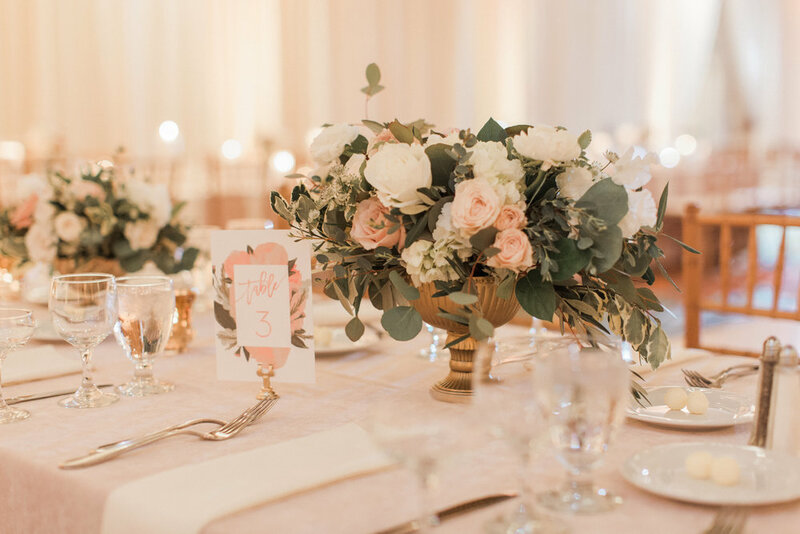 Luxe rose velvet table linens adorned guests tables topped with romantic florals by Love Blooms DC. 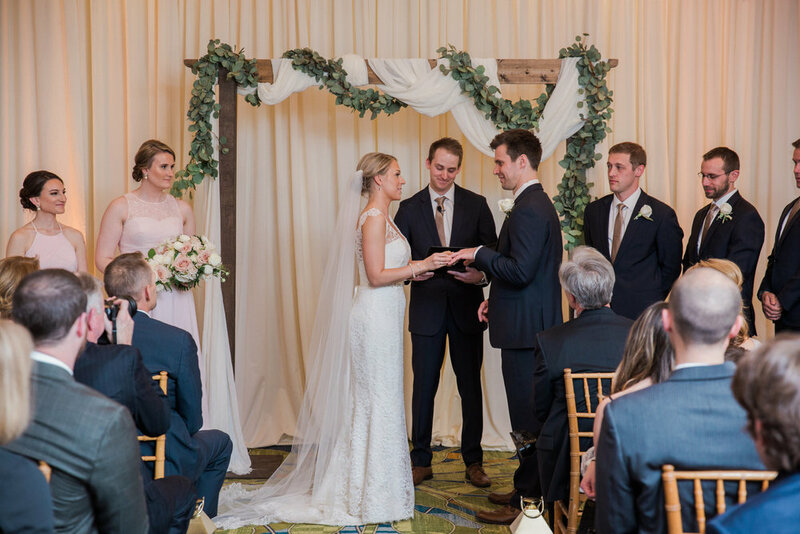 You could feel the love and joy in the air as guests danced and celebrated the new Mr. and Mrs. Crist. These two are truly lucky in love and I'm so happy to have been a part of their special day! Cupcakes | Kupcakes and Co. Within minutes of meeting Orly and Marc, I could immediately sense the love and respect they had for each other. 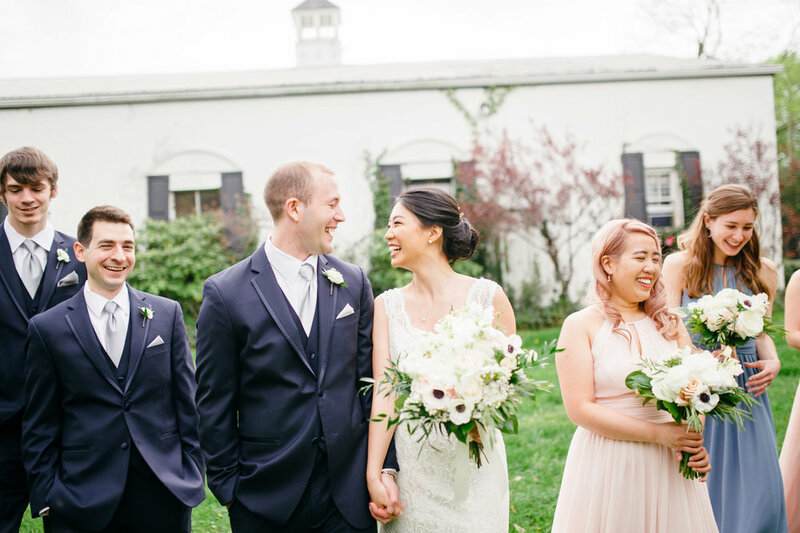 They don't take themselves too seriously or sweat the small stuff, and their wedding day reflected the lighthearted, awesome couple that they are. Orly and Marc's wedding at The Mayflower Hotel began with an inviting cocktail hour, followed by a traditional Jewish ceremony in Mayflower's East Room. 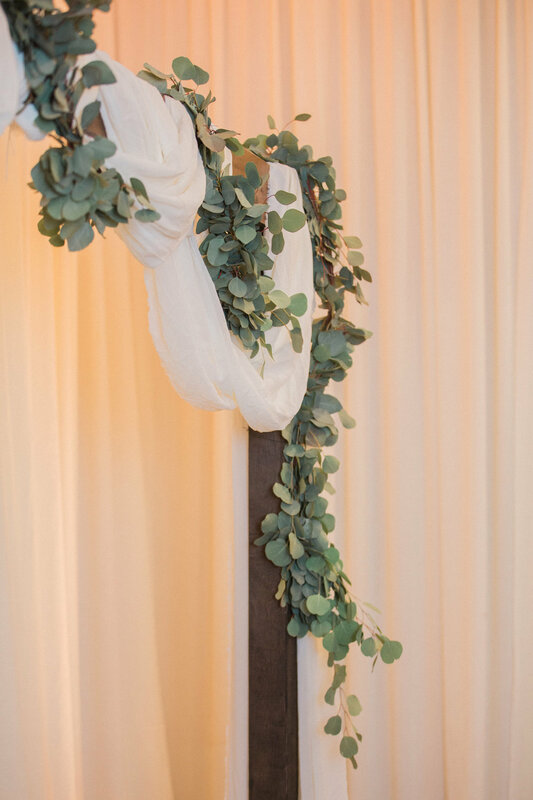 Bergerons Flowers designed an absolutely breathtaking chuppah adorned with florals, branches and elegant draping. 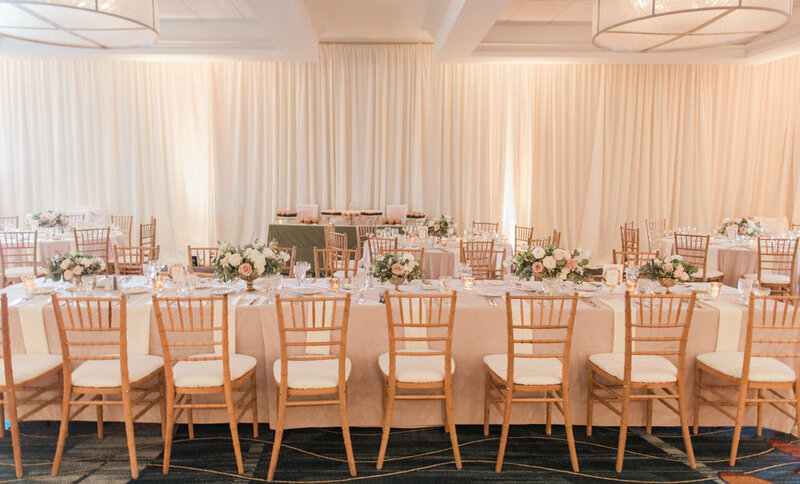 The ceremony aisle was lined with glass pillar candles and rose petals where their 220 guests took their seats as they officially became Mr. and Mrs. 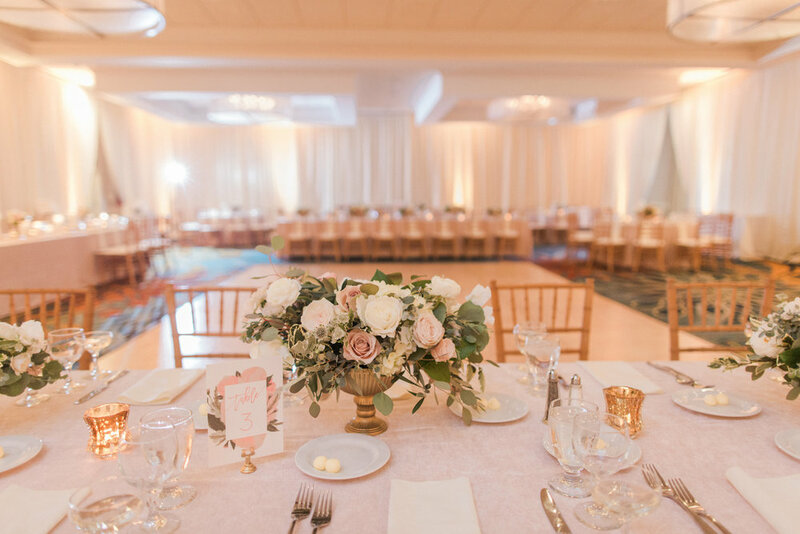 The celebration continued in Mayflower's Grand Ballroom, decked out in stunning pink, peach and white florals, lots of romantic candles and amazing live music performed by Onyx. See all of their gorgeous day captured by The Madious ahead! Look closely, and you may spot a rare cameo of me in front of the camera ;) Congratulations to Orly and Marc, it was an honor to be part of your special day!